Recently we were contacted by the fine folks at Tagamoto asking if we’d do a review of their toys. I reached out to my reviewer Jennifer who has her own blog, My Big Blue World. Jennifer agreed to do the review with her family and has provided her honest opinion here. Tagamoto is a brand new way to play, brought to you by the makers of HexBugs! What is it you ask? Well let me tell you! It is a super cool play system where you control the road. The vehicles react to unique codes placed on the track. What can the Tagamoto cars do? They can start, stop and speed up, crash, break down and get repaired! They have working headlights and tail lights and even a working radio! There are 13 vehicles that have over 15 realistic sounds including engine revving, horn, sirens and more. Complete with stop signs, road signs and safety cones to make your trip a little more exciting. The really neat thing about this set is that you can make the cars lights and radio come on, the engine can stall out and you can even make it move fast or slow around the track. There is not just 1 way to play, but 3 ways to play! Road Codes- Cars follow the roads and react to the codes. Press the orange button on the bottom of the car and release to turn on the vehicle in road code read mode. Off Road- No roads required! Runs on most smooth surfaces. Just press and hold the orange button for 4 seconds and away you go! Free Roll- The front wheels snap down to free roll! I was lucky enough to receive the “City Road Set” to review and my boys had a BLAST with it. They were so excited and were bursting at the seams to put it together. I have woken up to the sound of the car starting for the last couple of days now. That sound is then followed by my boys laughing and giggling as the car zips around the track. Sometimes the car goes a bit crazy and swerves all over the wrong part of the road which can be quite entertaining. But for the most part it zooms around as it is supposed to and reacts to the codes perfectly. 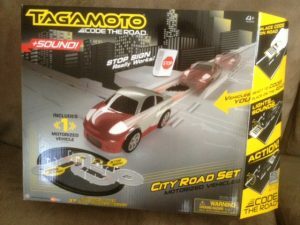 The City Road Set includes over 37 pieces and comes with one car. The hardest part I found was putting on the little bitty stickers (road signs ect). It was all ready to go within 10 minutes which was great. Overall it is a really easy track to set up and the boys love it which is the most important thing. This would be the perfect gift for the car crazy boy in your life, they add so much more to play time than a normal playset! Definitely gets an A++ from this momma. Disclosure: We received the products for this review free of charge but as always opinions are our own.